Can you imagine a time without computers, the Internet, or TV? Telephones were connected to walls by wires, and a "cell" was a place to put bad guys. The daily news was delivered by a paperboy, not a cable news station. Laptops were where children sat to tell Santa their Christmas wish-lists. Magazines were presented on pulp, not ipads. Mass communication was brought into the home via vacuum tubes, not microchips. In the 1930s the radio was the centerpiece of the family room. Feel the warmth from the unit, more an elegant piece of furniture than any modern electronic device. As the tubes heat up, two children, a boy with tousled hair and his younger brother, sit excitedly in front of the enchanting device, their eyes gently twinkling in the golden glow of the dial, the only light in the room. The subdued light feeds their imagination as they delight in the fantasy unfolding in the imaginary theatre of the mind, following the thrilling tales of heroes of yesteryear. The 1930's spawned a new type of hero. They were the champions of a halcyon era, a genre unto themselves. They were non-conformists who couldn't sit back and watch the word fall apart around them. They endeavored to fix it. They were super detectives that used tricks, gadget and gimmicks in service of society. They used their unique resources for the good of mankind. They were secretive vigilantes that held villain's accountable for their dastardly deed. They were mysterious costumed crusaders who hid behind masks and worked outside the bounds of law. They were self-governing agents of justice helping the helpless, protecting those who couldn't protect themselves, and staving off oppression. They appeared in the early days of comic books, adventure comic strips, and pulp magazines. Their movies were black and white serials with cliffhanger endings keeping the crowds coming back week after week (at 25 cents a pop!). The heroes of these stories risked life and limb sorting right and wrong in a different time, in some ways a simpler time. In this fantasy world it was easier to tell the good guys from the villains. Heroes like The Shadow (1930), The Phantom (1936), The Green Hornet (1936), Batman (1939), Spy Smasher (1940), and Captain America (1941), provided a heroic archetype, and brought order to the chaos wrought by villains. These characters formed a shield between the bad-guys and the rest of us. We looked to the heroes of the past for inspiration as they fought for a better future. One hero of the past stayed hidden in the shadows. She was unseen and unknown until discovered decades later. Her name was Pandora Driver. Her's is the tale of a young girl forced to grow up too fast as a matter of survival. Pandora became the relentless avenger of the common man sifting right from wrong in a realm where the villains were the local gentry and the heroes were outlaws. Pandora was a mistress of disguise who used sly audacity and an unstoppable future-car to unleash misery into the halls of wealth and power. She infiltrated the unscrupulous elite of Citadel City and adopted their unsavory methods to usurp them. Her fight was the fight of the ages. She was the fist of the people, battling greed, graft, inequality, and exploitation. Her time was in the past, but the problems were the same blights facing society today. These Heroes intervened when law enforcement or the justice system failed citizens. Sometimes their methods were unsettling. Battling sin in the filth where it resides can dirty even the purest hearts; the good old days we remember in monochrome were lived in color. In a time when good and evil was simply black and white, Pandora lived in the gray area. 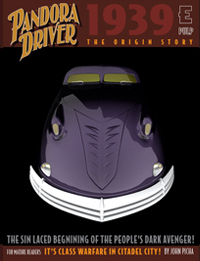 Pandora Driver The Origin is a retro-hero tale for adults in the form of an e-pulp. It's the 1930s. The avarice of the elite has plunged the country into a the Great Depression. In Citadel City, class warfare has been waged on the less fortunate long enough. Something is about to snap! Young Betty McDougal discovers how hard life can be when her family is evicted from their farm and forced into a shelter in Citadel City. It's a struggle to survive. It's a time of desperation, sin, mistakes, bruises and lessons Betty didn't want to learn. Her life seems hopeless until a mysterious stranger delivers an unstoppable car of tomorrow. It transforms her. Pandora Driver is frustration personified. Through disguise, guile and lies, she brings chaos to a world of wealth and power. In a time without hope, this masked heroine served justice with a knuckle-sandwich! Pandora Driver: The Origin is a retro-hero tale for mature readers. It ain't Shakespeare. It's pure Pulp! including her mysterious car, on Youtube. Pandora Driver is Copyright and Trademark John Picha. All Rights Reserved.